Raaga.com: Who is the ‘Most Stylist Don’ on screen in Indian cinema? Who is the ‘Most Stylist Don’ on screen in Indian cinema? Indian cinema’s obsession for underworld has been intense. Whenever a movie depicting the bitter truth of the underworld has been made it has been a grand success. Remember SATYA, COMPANY, SARKAR, ONCE UPON A TIME IN MUMBAI, SHOOTOUT AT LOKHANDWALA, SHOOTOUT AT WADALA etc. Besides Bollywood the craze for underworld films is equally found in South Indian films too. The recent Rajinikanth upcoming film KABALI is the best example. Though many actors have played the role of underworld don there are few who have left an incredible mark. Raaga.Com picks three top superstars of Indian cinema who play underworld don on screen and ask the readers to decide who plays the Most Stylist Don? 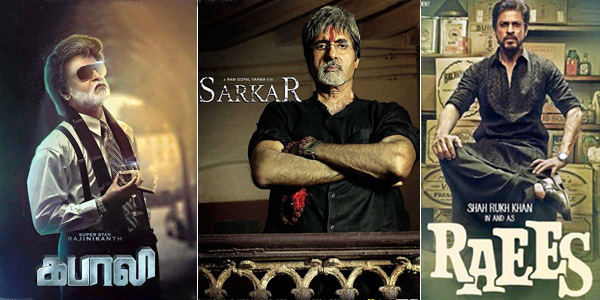 Ram Gopal Varma’s SARKAR was a humble tribute of Ram Gopal Verma to Hollywood’s all time classic film THE GODFATHER. Like the protagonist Don Vito Corleone (Marlon Brando) in THE GODFATHER, Amitabh Bachchan plays the patriarch and the film revolves around him and his sons and how the family mafia business is carried forward. The highlight of the film, of course, was Amitabh Bachchan’s towering performance, which if not better than Marlon Brando was at least at par with the legendary Hollywood actor. Unlike the sophisticated Don that Shah Rukh Khan played in Farhan Akhtar’s DON, Shah Rukh Khan in his upcoming film RAEES will be seen playing a middle aged Gujarati based Muslim local Don, who is involved in the illegal business of liquor. Dressed in simple black Kurta and traditional Lungi (Kindly note even Amitabh Bachchan dressed the same in SARKAR) Shah Rukh dons a stylish black beard and wears spectacles. His looks in the First look of the film are lethal and his dialogues, 'Baniye ka dimaag aur Miyanbhai ki daring', has taken the nation by storm indicating Shah Rukh will rock at the box office during Eid in 2016. After the playing the highly successful Don in BASHA, Rajinikanth will be seen playing an ageing Don in his latest movie KABALI, based on the true story of a Chennai-based Don. Recently a photo-shot of the movie was held at AVM studio for the movie’s First Look slated to be released on September 17, on the auspicious festival of Ganesh Chathurthi. Though the photo shot was held under tight security, the photo has been leaked. Photographed by eminent Korean photographer, Rajinikanth looks stunning in the first look poster. Dressed in urbane attire with suit, tie, and a white stylish beard Rajinikanth’s looks are surely mesmerizing and what makes his looks more arresting are the cigar and the wine cup that he holds with aristocratic attitude! Ever since the first look poster has hit online, it has a literally created a storm on internet. So readers who is the Most Stylist Don on screen?